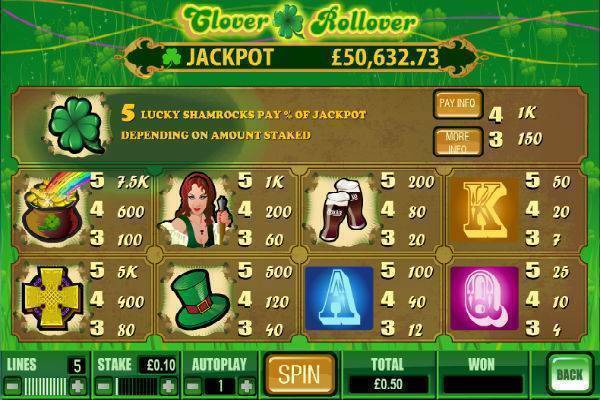 Clover Rollover starts with you choosing your bet per line from £0.02 to £1. You change this by pressing the up or down arrows buttons. You also choose how many of the 5 paylines to play, again, using up and down arrows. That means minimum bet is £0.10 per spin. There’s are no wilds here, no bonus games, and no scatters. There’s only one truly special symbol: a lucky shamrock. Get 5 on a payline and you may win the grand prize or a share of it. Pot of Gold: 5 on a payline will snag you a cool 7500x bet! Even 4 will pull in 600x. Golden Cross: 5 on a line will earn you 5000x. Not too shabby. Irish Lass: 5 of this comely lady will win you 1000 times your bet. Guinness Pints: 5 of this dark brew will pull in 200x, certainly enough to buy a round or two for all the lads in the pub. Playing Card combinations, on the other hand, will not set your pulse racing. Prizes are just 50x bet for 5 on a line. But hey: life doesn’t deal you a jackpot every spin. Ale costs a pretty penny these days, so at least you can afford a pint for yourself! 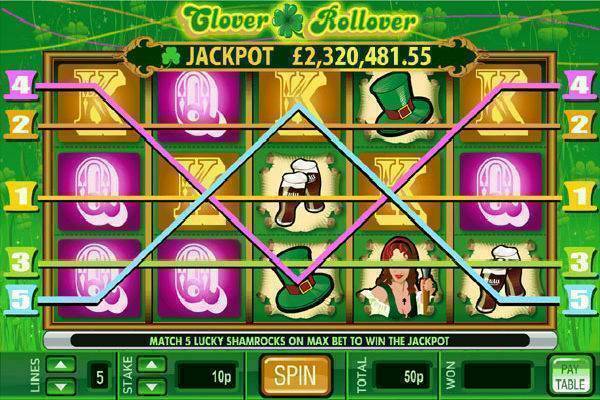 Clover Rollover once boasted an impressive progressive jackpot which frequently soared into the multiple millions of pounds sterling. But in October 2013, this jackpot was merged into a pool with other games. This slot no longer has its own progressive jackpot and the amount flashing above the reels may be far more modest level than in its earlier days. This jackpot can be won by landing 5 shamrocks. If you are playing with smaller amounts than the max bet of £1, your share of the grand prize will be pro-rated. So if you wager the minimum of £0.02 you will get a mere 2% of any jackpot. Still, the pot of gold and golden cross deliver impressive big wins, and a grand or two can still be yours. Clover Rollover has no wilds, scatters, bonus games or other special features. It’s always been about the jackpot. Clover Rollover is old school, but therein lies its appeal. It’s super simple to play, there’s not much to think about. Just hope lady luck is on your side, enjoy the 10 year old cartoony graphics and, if you are fortunate enough to hear them, celebrate with the happy sound effects that accompany a big win. The look and feel of this one won’t wow the lads and lasses of today, but don’t be surprised if its vintage charm has earned a loyal following among some of your mates. With a rather dismal RTP in the 93-94% range, Clover Rollover may not look to be a winner on paper. There are much better odds in classic slots, and in other progressive slots there are far bigger jackpots these days. Indeed, since the merger of its jackpot into a multi-game pool, its future is dubious. 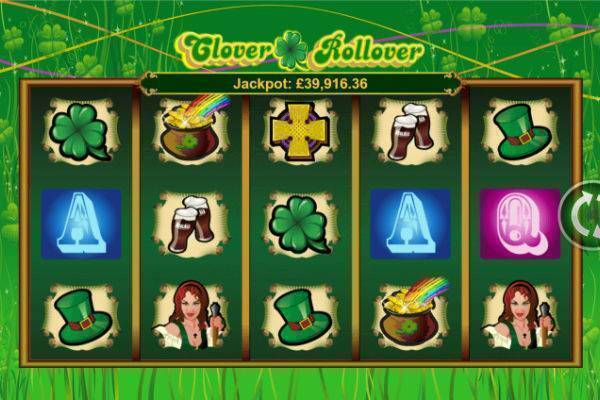 Still, if you like the Irish theme, and feel that Irish luck is coursing green through your veins, risk the max bet of a mere pound sterling and give this baby a go at one of our favoured casinos.